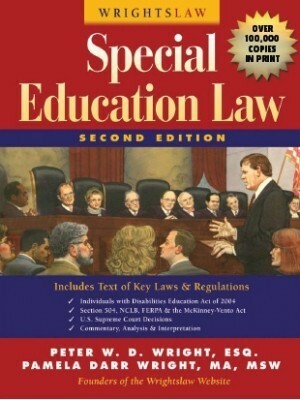 On December 28, 2016, the Department of Education’s Office for Civil Rights (OCR) and the Office of Special Education and Rehabilitative Services (OSERS) released a Guidance Package developed to provide parents and the charter school community with information about the rights of charter school students with disabilities. Students with disabilities who are enrolled in public charter schools, like students with disabilities enrolled in other public elementary or secondary schools, have important rights under two federal laws. Students with disabilities who seek to enroll in public charter schools or traditional public schools have important rights secured by these two laws. 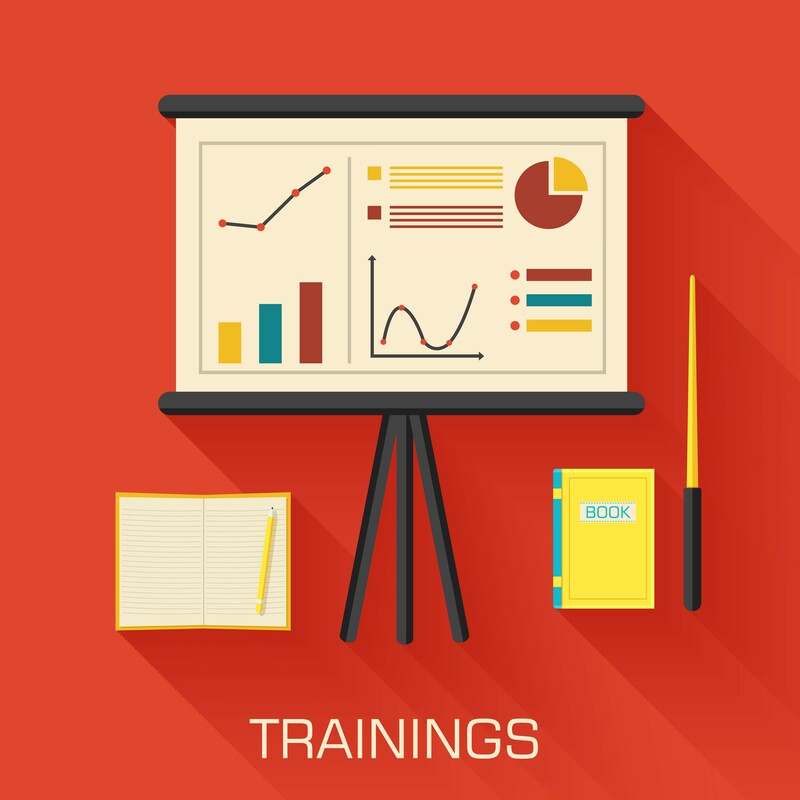 These documents provide information about how to provide equal opportunities in charter school recruitment, application, admission, enrollment and disenrollment, accessibility, nonacademic and extracurricular activities. 1. OSEP / OCR Dear Colleague Letter that updates educators, parents, students, and others about the rights of students under Section 504 and IDEA. Explains that charter school students with disabilities have the same rights as other public school students. 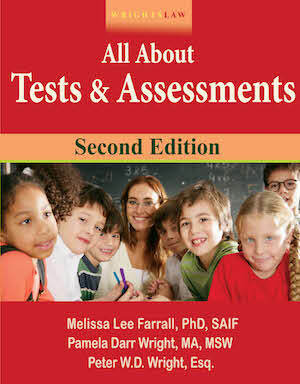 Describes the right to nondiscrimination in recruitment, application and admission to charter schools. Clarifies that during the admission process, a charter school generally may not ask a prospective student if he or she has a disability. Reminds charter schools and parents that students with disabilities have a right to a free appropriate public education under Section 504. 3. 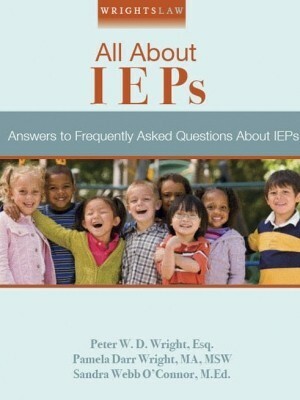 Frequently Asked Questions about the Rights of Students with Disabilities in Public Charter Schools under the Individuals with Disabilities Education Act (IDEA). 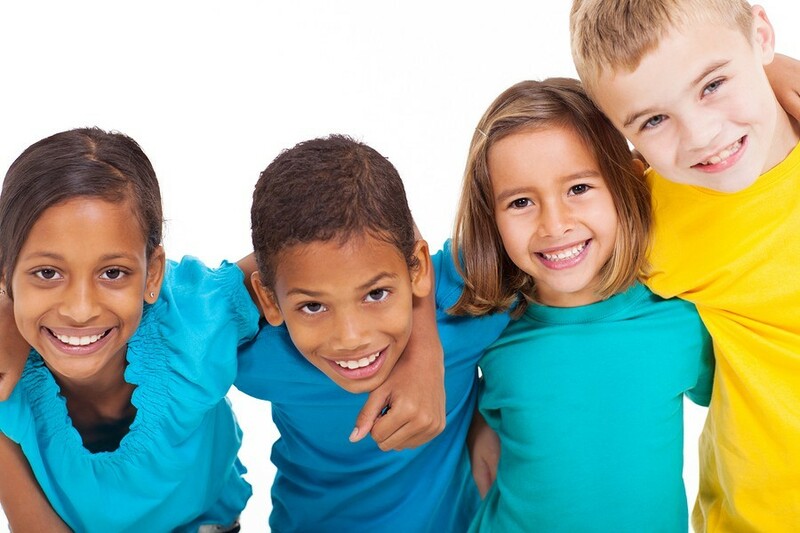 Emphasizes that children with disabilities who attend charter schools and their parents retain all rights and protections under IDEA, including the right to a FAPE, as they would at other public schools. Explains that a charter school may not unilaterally limit the services that will be provided to a student with a disability. Reminds charter schools about the least restrictive environment provisions that require students with disabilities to be educated with students who are not disabled, to the maximum extent appropriate. Clarifies that students with disabilities who attend charter schools retain all IDEA rights and protections included in the IDEA discipline procedures. 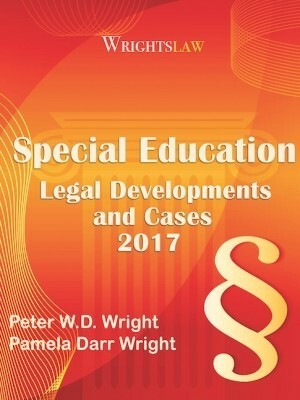 Very soon we expect to publish our next book in the Year in Review series, Wrightslaw: Special Education Legal Developments and Cases 2016. Stay tuned! 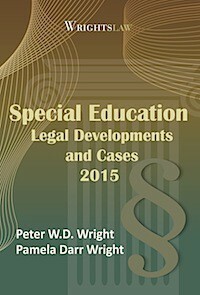 Legal Developments and Cases 2016 will include all “Dear Colleague” Guidance and Policy letters published by the Office for Civil Rights, Office of Special Education Programs, and Office of Special Education and Rehabilitative Services. These Guidance publications are useful when you need to educate yourself and when you need to educate school staff and administrators about their legal responsibilities. 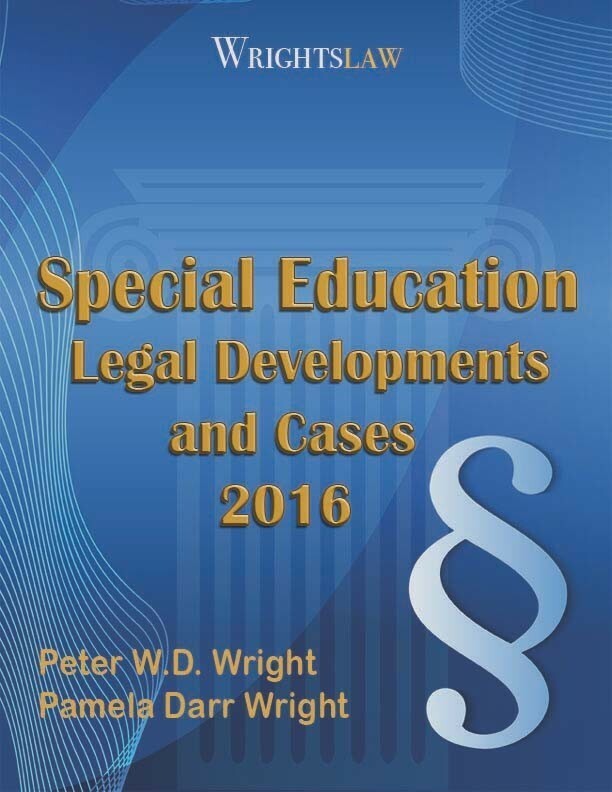 Legal Developments and Cases 2016 will also include all decisions in IDEA cases by Courts of Appeals in 2016 including court, legal issues, synopsis of decision, outcome, prevailing party, and link to all decisions. Click here for information about the 2015 Year in Review – Wrightslaw: Special Education Legal Developments and Cases 2015. 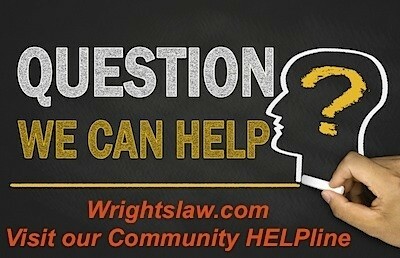 This entry was posted in IDEA 2004, Section 504 and tagged IDEA, Public Charter Schools, Section 504 by Wrightslaw. Bookmark the permalink. So here’s my question to the either- a charter school is developed along Montessori principles using Love & Logic. A student with a behavior disorder needs a more restrictive environment because of aggressive and destructive behavior, the school simply doesn’t have one (except maybe the conference room when its not scheduled) because it provides support in the classroom. The option is “home instruction”. 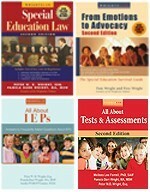 What are the parent/student’s rights, what are the school’s rights? If it is a PUBLIC charter school then a child with a disability has all the same rights as a child going to a regular public school. 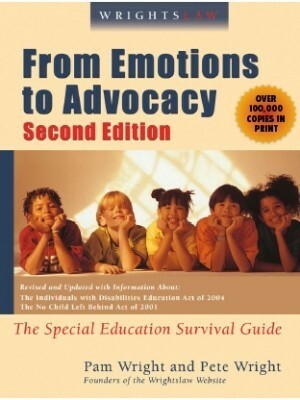 For many years, I have served as a special education teacher. I have attended meetings as an advocate. My son was in special education (adult now). I can relate from all perspectives. We need to direct energy to the root cause of problems: the federal and state governments. Schools need to be funded adequately, according to what law expects. 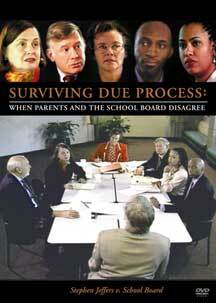 Battling each other takes attention off the politicians who vote to under-fund schools. In turn, schools are forced to work with less. It is getting worse. Protest. Ask for meetings with your reps. Flood mail with IEPs. Keep informed. Drop party allegiance & vote for candidate who will fund schools. Want change? Vote for people who support increasing funds to education! Support your educators! You will see change.